V8 Thunder Online • View topic - Trucks and Trophy cancelled, OuiOui Series launched for Summer 2010. Trucks and Trophy cancelled, OuiOui Series launched for Summer 2010. Trucks and Trophy cancelled, OuiOui Series launched as replacement for Summer 2010. 1st April 2010, Mallory Bark England, for immediate release. The V8 Thunder Admin Team is please to announce the formation of the OuiOui Monster Mile Series for Summer 2010 in replacement for both the iRacing Trucks, and Nascar Racing 2003 Trophy Series, the series will run to a triple header format on a Thursday evening, utilising two of Nascar Racing 2003's most hated tracks, yellows will be on but with no damage, the mod used will be the OuiOui mod, using standard mug physics. Each Thursday the evening will start at the Mallory Oval, running a 30 lap sprint race, followed by a similar length race at the Lady in Black - Darlington Raceway. Finally the third race of the evening will run for 15 laps on the Monsturd Twisted track, with both yellows and damage off, the series will run from Thursday 1st April 2010, through to December, with a double triple header of 6 back to front races being scheduled for 9am on 25th December 2010. Full Championship points will be awarded as per V8 Thunder regulations. Each driver will have a joker card, which he can play twice during the season, this must be "played" before the first race of the night, when a driver plays the joker card he will double his points for that evening's events. Contact is encouraged, and extra points will be awarded for drivers who push someone in the lake at Mallory, or the infield at Darlington, with double dog points on offer for getting someone out the circuit boundaries completely. For further information, please contact the OuiOui Series Director, Mr Big-Ears. Expert V8Thunder Beta driver Noddy puts the OuiOui car through it's paces at Mallory. Don't worry, Trophy as usual tonight lads! it's a serious announcement dude! 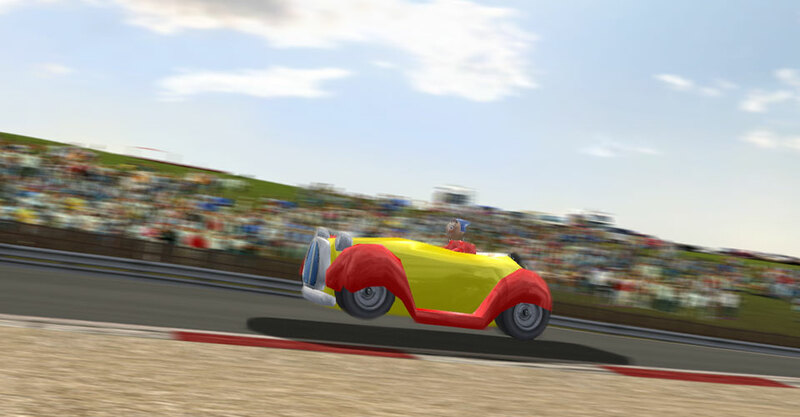 Noddy and Big Ears have put in tons of hours beta testing their car, they've even been approached by the Indycar Series about them using it in 2012, and NASCAR has been sniffing around cos word is they're looking for a replacement for the Car of Takeoff! Indycar are going with a cross between the Batmobile and a Sinclair C5. Wow...can't wait...I love messing around.